Sit back and relax as your driver takes you on a narrated journey from Las Vegas to the South Rim of the Grand Canyon. See a number of different panoramic views from various lookout locations while learning about the history and geology of the canyon from the expert tour guide. light breakfast, lunch, hotel pickup and drop and transportation by Mercedes Sprinter van is included. After early morning pickup, depart Las Vegas in a Mercedes Sprinter van for a day at the Grand Canyon’s South Rim. On your exclusive stop at the National Geographic Visitors Center you'll enjoy lunch (included) before viewing National Geographic's exhibits of the Grand Canyon, including the amazing photo gallery. You'll get a spectacular taste of the Grand Canyon when you attend a screening of the most watched movie in IMAX history, Grand Canyon: The Hidden Secrets. The footage captured by airplanes, helicopters, hang gliders and canoes is truly incredible. Next, it's on to the National Park where you will visit the three spectacular lookouts, Mather Point, Bright Angel Lodge and Yavapai Point. 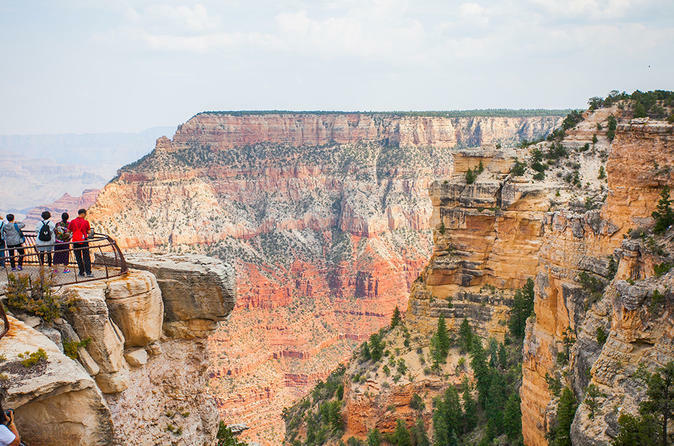 Take a hike along the various trails to lookouts such as Mather Point, visit the historic El Tovar Lodge, shop for souvenirs or simply sit and gaze at the awe-inspiring beauty of this seventh wonder of the natural world. There is approximately 45 minutes at each look out point and 1 hour at the Grand Canyon IMAX Theatre.